Having a local development space is critical for today’s developers. Some IDEs like PHPStorm and Visual Studio ( For the Microsoft side of things ) already have this type of functionality built in. What the following will cover is installing a based local server: WAMPServer ( Windows Apache MySQL and PHP Server ). A WAMP Server will give you power over your MySQL Database and any kind of Apache settings you are attempting to test out. 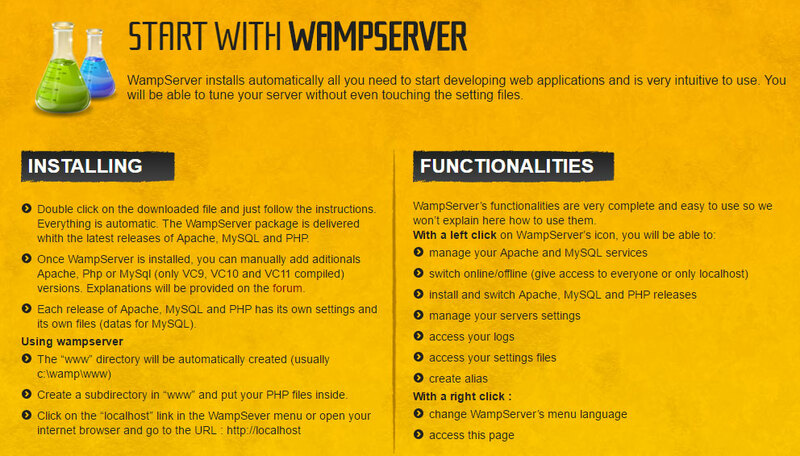 To begin with we need to download the actual software from the WAMP Server website. Here you’ll need to decide wether your a 64-bit install or 32-bit install is more preferable for your PC. Once downloaded, double click the .exe downloaded file which will open an installation wizard; follow those instructions until you get to “Finish”. There shouldn’t be anything you need to watch for or absolutely need to change so you can quickly click through the settings leaving everything default. It may ask you whether you would like to change the default browser from Internet Explorer and you may if you know where to find your other browser, the same goes for your default text editor. Again, changing these are entirely optional. Localhost – This is where you’ll be able to see all your projects live depends on where you decide to put it. Should we make a folder call “test” in the www root, our project location will be “localhost/test/index.php”. PHPMyAdmin – You’ll be able to manage and add new databases from here. Password: Leave this field blank, there is no password. www Directory – This is where all your projects will be stored. To keep things nice and tidy you’ll want to make folders for each project. The Apache, PHP, and MySQL folders are all full of specific options for that technology. Out of the box you shouldn’t need to mess with any of these settings but if you’re curious or testing things out this would be the place to change those settings respectively. You’ve now installed and configured a WAMP Server. At this point you can add and view PHP files through your localhost! There will be no password so leave that field blank. Once logged in you’ll see a list of default databases to the left-hand side. Click the “New” link at the very top which will allow you to create a new database. You may call it whatever you like but the suggested Collation should be utf8mb4 but if you leave it empty the WordPress installation will still work just fine. The database will be empty by default but it will autopopulate with tables once the WordPress installation is complete. Next we’ll need to download WordPress from the .org website. This will give us a zip file containing all the necessary installation files on the most up to date version of WordPress. Extract (unzip) the files and copy / paste them into your WAMP www project folder. Clicking the WAMP [ W ] icon we need to click on “localhost” and find our projects folder in the bottom “Your Projects” list. Once your project opens up in your preferred browser WordPress will greet you with a “Pick your language” screen, then an instructional screen informting you on what you’ll need to proceed. We’ve already set up our database at this point so Let’s Go! Database Name: This will be whatever you’ve named the MySQL database, I’ve used “wp_database” here as seen in the image above. Database Prefix: This is important to modify slightly. Keep it short and simple but ensure you add an “underscore” to the end. WordPress installs all the same database tables so prefixing them with only something you know makes it harder for hackbots to guess what your database table names are. I’ve used “wp_test_” as the database prefix. 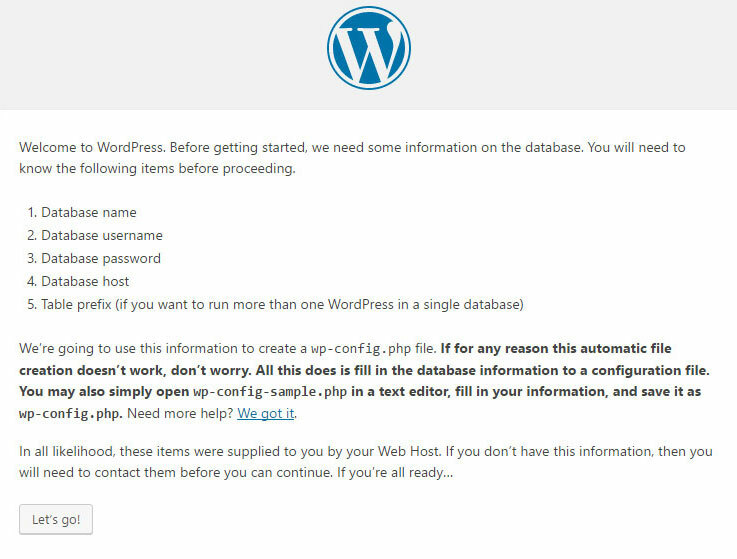 Once WordPress verifies that it can connect to the database it will ask you if you would like to proceed with the installation. Of course you do! The next and final step is to set up the purpose of your WordPress website and the initial administrator user. 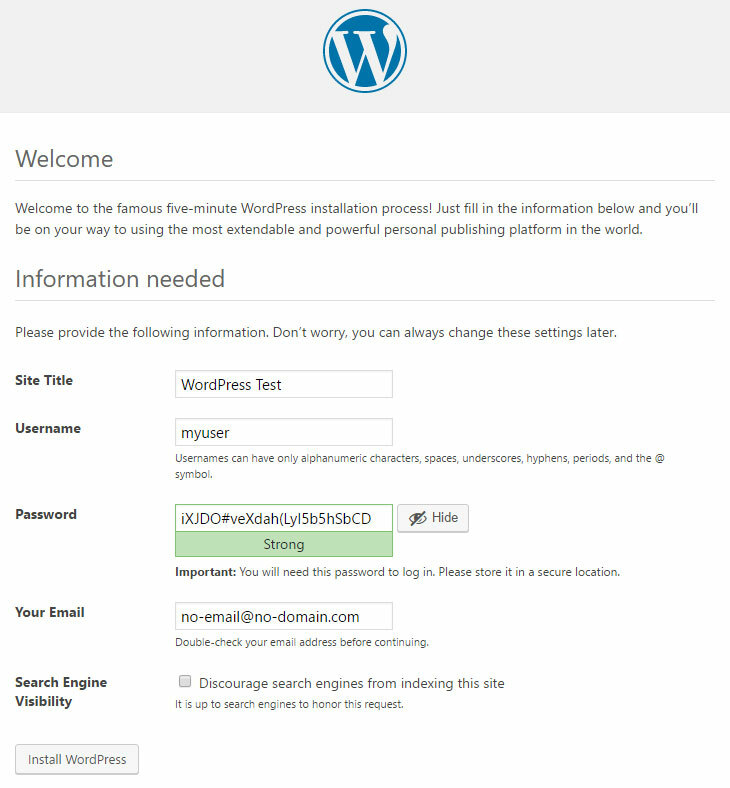 The below section should be all self explanatory, just make sure that you remember your username and password for logging into the WordPress install.